K 2 Compact Car & Home 16731250 https://www.kaercher.com/ae/home-garden/pressure-washers/k-2-compact-car-home-16731250.html Compact and practical: the "K2 Compact Car & Home" high-pressure cleaner is ideal for removal of normal dirt around the home. 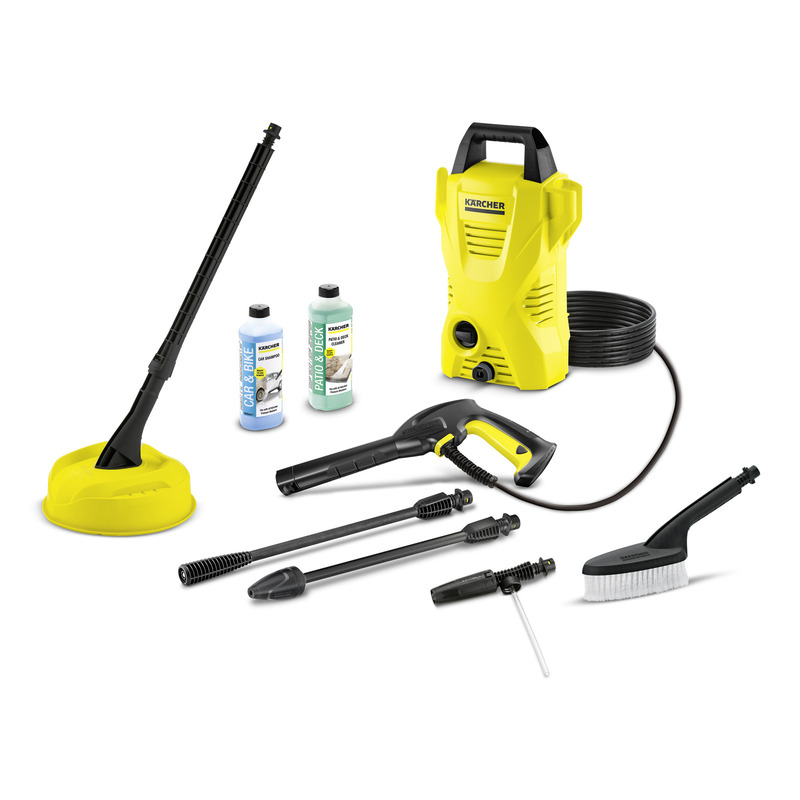 With Car Kit (wash brush, foam nozzle, car shampoo) and Home Kit (T 150, Patio & Deck). Compact and practical: the "K2 Compact Car & Home" high-pressure cleaner is ideal for removal of normal dirt around the home. With Car Kit (wash brush, foam nozzle, car shampoo) and Home Kit (T 150, Patio & Deck). Compact and powerful. The "K2 Compact Car & Home" is the proof. This high-pressure cleaner is very versatile, mobile and easy to store. The Home Kit is ideal for splash-free cleaning of large areas around the home thanks to the T 150 surface cleaner and "Patio & Deck" cleaning agent (500 ml). The Car Kit which includes a wash brush for effective removal of grey film, foam nozzle and 500 ml car shampoo ensures a gleaming all-round shine for cars, etc. Additional features include a trigger gun, 4 m high-pressure hose, spray lance, dirt blaster with rotating pencil jet for removing stubborn dirt and water filter.